Give your scope rings some leverage. 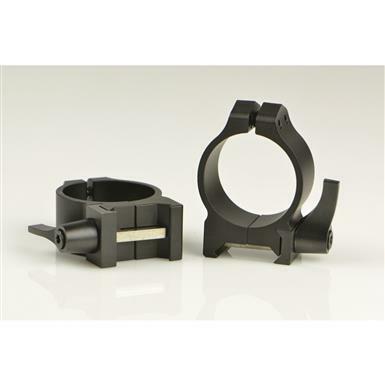 Warne 201LM 30mm Quick Detach Matte Rings sport a unique indexable lever system that allows you to remove your optic from the rifle and reattach it with no loss of zero. You can also index the location of the lever once the rings are affixed to the base. The Square Recoil Control Key guarantees your rings will not shift or move under fierce recoil and also protects against peening or swaging when mounted on aluminum bases. Extra High rings: Fit up to 62mm objective, .65"h., 7.7 oz. High rings: Fit 50-56mm objective, .525"h., 6.9 oz. Medium rings: Fit 42-52mm objective, .375"h., 5.9 oz. Low rings: Fit 24-42mm objective, .25"h., 5.2 oz. Make your line of sight work for you. Extra accuracy provides you with pure plinking pleasure.